Director-producer Karan Johar's heartfelt plea seems to have fallen on deaf ears. Despite his honest request to MNS for his film Ae Dil Hai Mushkil's release, the political party has stubbornly stuck to its stand and continue to oppose it. Amey Khopkar, President of Maharashtra Navnirman Chitrapat Karmachari Sena, has raised concern over the fact that Johar in his statement did not mention Pakistani actors and instead used the term talent. Speaking to Firstpost, he says, "Karan woke up very late! This isn't the time to say sorry! He has had a change of heart, we haven't! We are still firm on our demand and no multiplexes will show Ae Dil Hai Mushkil. If they do it then we, in our own style, will break their screens. This issue is not only after Uri incident but goes back to many years. We apologise to all who will not be able to see the movie. This is a warning to all producers and film makers to see to it that from here on they shouldn't take Pakistani artistes in their films. Agar koi bhi producers ya production house ne Pakistani artistes ko liya to unko pitenge. (If any producer or production house hires Palistani artistes then we will beat them up)." Meanwhile Ae Dil Hai Mushkil's distributors Fox Star Studios have extended their support to Johar. Filmmaker Karan Johar is a patriotic Indian whose nationalism cannot be questioned, says Vijay Singh, CEO of Fox Star Studios. Singh said in a statement, "Karan Johar is a proud, emotional and patriotic Indian like all of us and his nationalism cannot be questioned. Fox Star Studios, India, whole-heartedly stands by him at this time." He said his team is slated for the Diwali release of Ae Dil Hai Mushkil on 28 October. "We have been assured that the police will provide protection to all theatres, including single screens and multiplexes, should there be any requirement," he added. Singh's statement comes after Karan broke his silence on the vandalism threats issued by right-wing Hindu outfits opposing the release of the film, which stars Pakistani actor Fawad Khan. Singh said, "We unequivocally condemn the terror attacks on India and support the government of India in all its effort to bring safety and peace for Indians." "The film has been made by an Indian director — film's actors Ranbir Kapoor, Anushka Sharma and Aishwarya Rai Bachchan are all Indians; the crew who have worked tirelessly on this film to see their labour of love in theatres with their families are all Indians," Singh said. 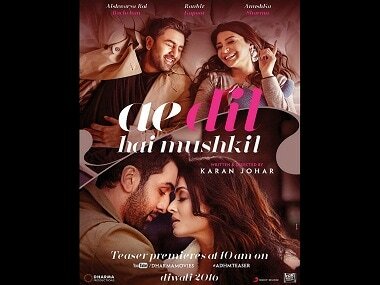 Fox Star Studios, which has a nine-film deal with Johar's Dharma Productions, has also produced Ae Dil Hai Mushkil. On its part Mumbai Police has assured safety in theatres during the screening of the film. DCP Ashok Dudhe, spokesperson for the city police, said to The Times of India, "We will deploy our personnel and provide security to all the multiplexes and single-screen cinema halls. Our job is to maintain law and order."